HOUSTON - Feb. 17, 2018 - PRLog -- Demetria Smith is a mortgage broker and community activist. She recently made headlines when the Democratic Party wrongly bumped her from the primary ballot, over a banking mix-up that caused her filing fee check to be returned. But now Demetria Smith is back and running as a write-in candidate in the 2018 Texas gubernatorial race. Smith has filed a federal lawsuit, still pending in federal court, against the party decision to unlawfully remove her from the 2018 Democratic Primary ballot. "They may have removed me from the primary ballot but they can't remove me from the fight to protect the Constitutional rights of the citizens of Texas. I'm still eligible to run for Governor." Smith said. "I filed on December 11, 2017, and if they were going to declare me ineligible, they had five days under the law to notify me but they did not." Smith has always referred to herself as "the Constitutional candidate." Her horrific experience with the Democratic Party has only reinforced her dedication to take power out of the hands of elected officials and put it back into the hands of the people. "Transparency must be brought back to government," Smith said. Smith is a fighter and has triumphed over many challenges as a single mother of six adult children. She is a successful financial expert and all of her children are educated business professionals. Smith connects with everyday people. People who relate to Smith, just want the best for their families. 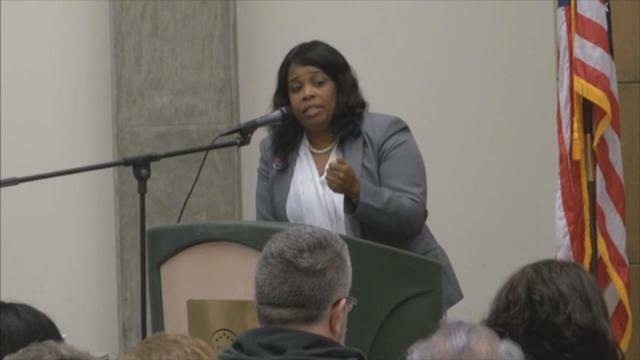 Smith wants to get rid of agenda-driven statutes that directly conflict with the Constitution of the United States and infringe on a person's unalienable rights. Demetria Smith is a bold and dynamic candidate for Texas governor who will defend the people of the "Lone Star State." But Smith's name will not appear on the November 6, 2018 Texas General Election ballot. Supporters will have to write her in.